dissolve 50g (approx. 5 tablespoons) of the product in 150-250 ml of water. Depending on individual demand use 1-3 times a day, especially before and immediately after a workout. Depending on requirements, use 1-3 times per day. 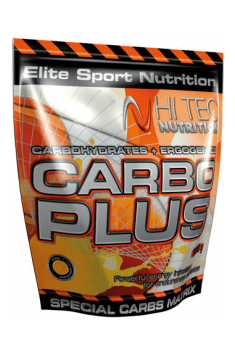 Carbo is good to use before, after and possibly during exercise. On rest days it's definitely better to supplement the carbohydrates with regular meals. A formulation containing 6 advanced forms of creatine. It supports lean muscle mass building and increases strength. Creatine malate in capsule form. It provides greater strength and energy, and helps to build muscle mass. High dose of creatine malate. It provides greater strength and energy, and faster growth of muscle mass. Dietary supplement containing taurine. Supports the synthesis of proteins, protects the liver and nerve cells. Creatine monohydrate. Increases strength, improves muscle building, anabolism, and inhibits catabolism. Glucose (dextrose) - saccharide (dextrose) belonging to carbohydrates, which is a basic component of complex sugars. Glucose is used in the body as an energy source, in particular for the brain and red blood cells. It is used directly or stored as glycogen in the liver and muscles. It participates in the synthesis of alanine, converted accumulates in the fatty tissue. For this reason it is not recommended in programs of weight reduction and improved body composition. In chemically pure form is used as a sweetener. Due to tts energy capacity, it used in beverages used in sports as well as in nutritional amino acid and carbohydrate-protein supplements, in the form of dextrose is the basis of so-called. "creatine transporters." Dosage: according to individual needs, usually pre- and post-workout, before and after exercises. HCA (hydroxycitric acid), an organic acid that occurs in the peel and fruit plants: Tamarindus and garcinia, citrate lyase inhibitor, it can reduce appetite and food intake and slow down the synthesis of fatty acids and increase glycogen synthesis in the liver. Used in sports supplementation as a factor in weight control while reducing body fat, and also prophylactically with eating high-calorie meals. It can be used in a diet for people with low physical activity. It is available as mono-preparation and multicomponent slimming supplements, acting neutrally for people sensitized to caffeine. Dosage: 300-1200 mg per day in divided doses.